No One Could Out Negotiate Lincoln Dealer, Kyle Gillespie. For those who grew up during the Great Depression, buying a Cadillac or Lincoln was something you did only if you were past 50. Although my daddy, W.W. Cherry, preferred the look, style and comfort of a Cadillac, loving to take on the city’s best negotiator required that he buy Lincolns. Kyle Gillespie owned the Lincoln dealership. Trying to outfox him, my daddy thought, was the ultimate challenge. “Bill Cherry, shame on you. You and I go to church together, and here you are trying to steal a car from me. But to keep you from being a 61-year old crook, I’ll let the blue one with the genuine cloth upholstery go for $9,500." Daddy took out his wallet. It was full of brand new $100 bills. He pealed off five of them and set them on top of the $9,000 check. “I’ll have it ready for you in the morning,” Mr. Kyle said, continuing to chew his ever-present piece of gum, but sensing the deal wasn’t finished. “I’m going to really like that 1970 gold Lincoln with the 8-track stereo system, the gin-you-wine leather upholstery and the moon roof,” Daddy said like it was just to recap. That was the summer the American National Insurance Co. board of directors brought in a younger man named Glendon Johnson to be the new president. 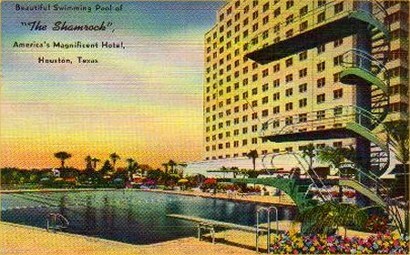 Since Daddy was one of the company’s directors and senior officers, it was decided that the sales managers from all across the U.S. would be brought to the Shamrock Hotel in Houston where Daddy would introduce Mr. Glendon to them with a rousing introduction. His associate, Arnold Frankovich, would arrange for big red, white and blue banners to be draped across the front entrance to the Shamrock, and there’d be the most elaborate buffet in the Emerald Room. At a prescribed time, the sales managers would gather around the front door, under the red, white and blue banners. Daddy would bring Mr. Glendon from the airport in the new Lincoln. As they would start up the long driveway, a Dixieland band would start playing and the sales managers would blow whistles, play kazoos and wave flags. Then Daddy would pull up in front, the doorman would open the car’s right door, and Mr. Glendon would jump out, joyous and smiling and shaking hands with this one and that. Daddy wasn’t able to pick up the new 1970 gold Lincoln Towncar, the one with the leather upholstery, the 8-track stereo, the moon roof and the full tank of gas, from Mr. Kyle until moments before he was to leave Galveston for Hobby Airport. As he approached the airport, he realized the gas gage was on empty. Had Mr. Kyle forgotten to put in the free tank of gas or was the gage not working? He had no time to stop at a service station to see. Mr Glendon’s plane would be landing in moments. Daddy parked the new Lincoln at the door and went inside to meet Mr. Glendon. When they came out and got in the car, it wouldn’t start. No amount of praying was going to put gas in an empty tank. Just then a big linen truck drove up and parked behind the Lincoln. Daddy got out, went back to the driver and said, “Hi, I’m Bill Cherry.” He stuck out his hand. “The name’s Calvin,” the driver said with a skeptical look as he shook Daddy’s hand. Calvin said he couldn’t let Daddy and Mr. Glendon use his truck, but he would drive them to the Shamrock so he could save the day for his good customer. However, Daddy and Mr. Glendon would have to ride on the bags of dirty laundry in the back since there was only one front seat. Fine. Daddy and Mr. Glendon jumped in the back, and Calvin left for the Shamrock. When he started up the Shamrock’s long driveway, Mr. Glendon and Daddy could see the big red, white and blue banners, the several hundred sales managers gathered around with their whistles and kazoos and the Dixieland band waiting to play. The doorman saw the truck coming up the guest entrance driveway rather than going around back to the service entrance. He went nuts, blowing his taxi-calling whistle and waving his hands wildly. Calvin kept on coming. When he got to the front door, he jumped out, opened the back doors to the truck, and out flew Mr. Glendon and Daddy. The bewildered sales managers started blowing their whistles, playing their kazoos and waving the flags. The Dixieland band cranked up “When the Saints Go Marching In” Daddy palmed a crisp C-note from his wallet and passed it on to Calvin. In the Emerald Room, Daddy took the podium and began his glowing introduction of Mr. Glendon, never mentioning the unusual arrival. Then Mr. Glendon took the mike, smiled as only he could and opened with, “Unaccustomed as I am to arriving this way....” Everyone howled. 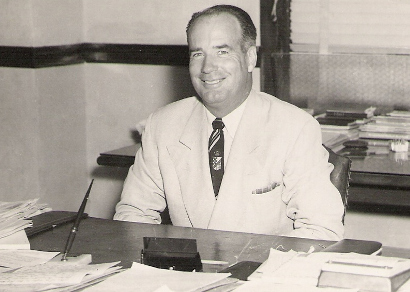 Mr. Glendon left the American National seven years later. Daddy, retired by then, continued driving Lincolns. But I don’t recall that Mr. Glendon ever bought one. Mr. Kyle will be 91 years old this year. Daddy will have been with the Lord for 31 years, a loss I’ve never quite gotten over. For those reasons, it seemed to me to be a superb time to share this story about two dear friends.